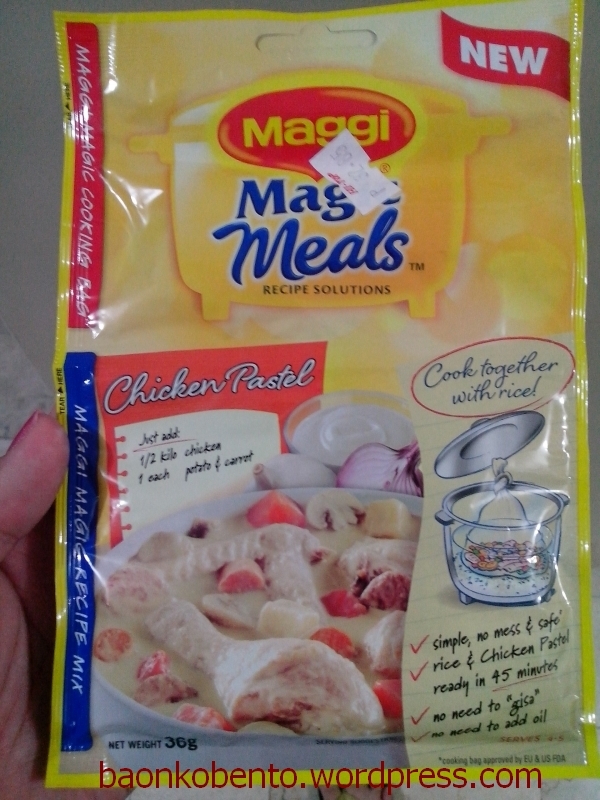 One of my staple baon viands recently is Chicken Pastel, made so easy because of Maggi Magic Meals. I discovered this when Maggi was giving out samples at my work place. 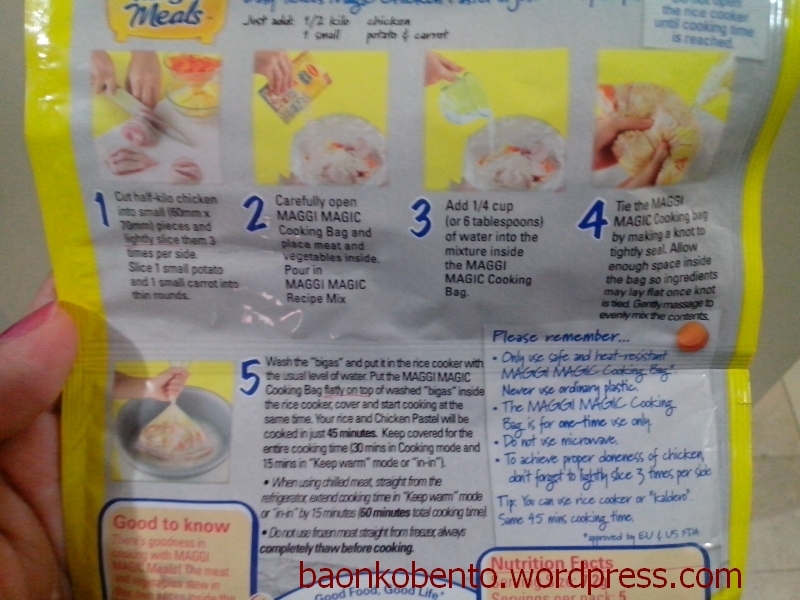 The idea of the Magic Meals is simple: put the required ingredients in the provided plastic bag, tie it shut, place it in the rice cooker along with your prepared rice and water, and cook it for 45 minutes. 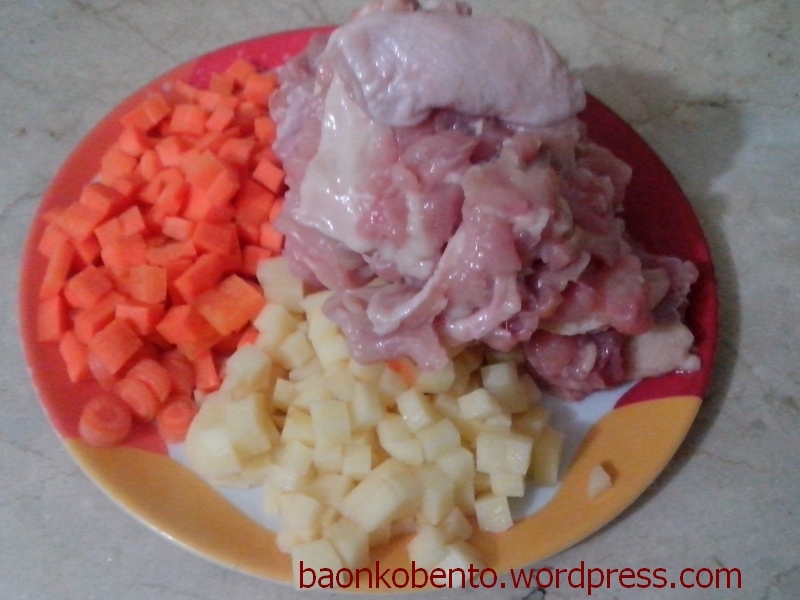 Let me show you how I did this Chicken Pastel. This is what the Magic Meal pack looks like. As you can see, I bought it at Hi-Top for Php32.85. 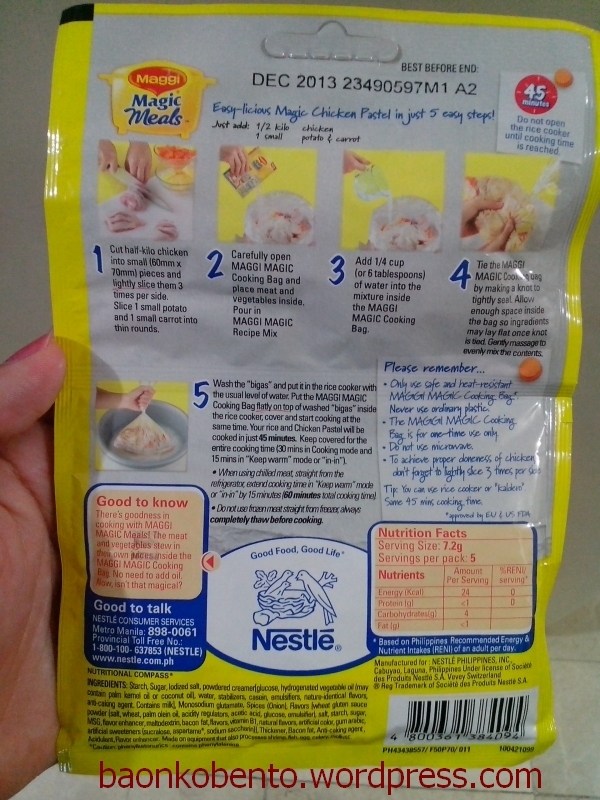 I’ll now show you the steps I took to create my latest batch of chicken pastel. 1. Prepare your ingredients. Here I took a largish carrot and a medium potato, which I peeled and diced. I also have half a kilo of chicken thigh fillets, which I cut into small parts and scored the meat sections three times each to let the flavor in. I chose thigh fillets because it’s boneless (making it easier to eat when I take it to work) and more flavorful than say, breast fillets. This batch is extra fatty, which contributed to a creamier pastel later on. 2. 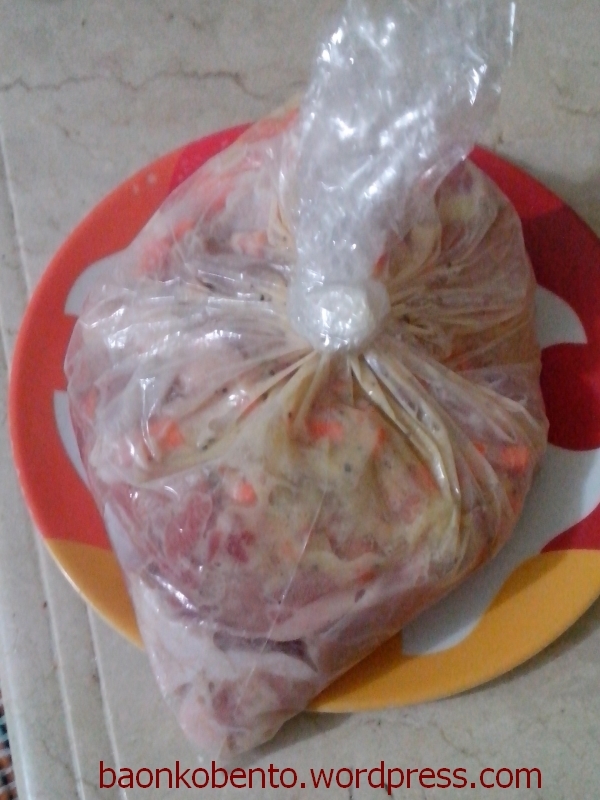 Open up the provided plastic bag. It has a red sticker that keeps it folded. I take the effort to remove all traces of this sticker to make sure I won’t have sticker bits or glue in my rice. Put all the ingredients in the bag, then add the flavoring powder (bottom section) and 1/4 cup of water. 3. Seal the bag, making sure that the bag will lie flat and there isn’t much air inside. 4. 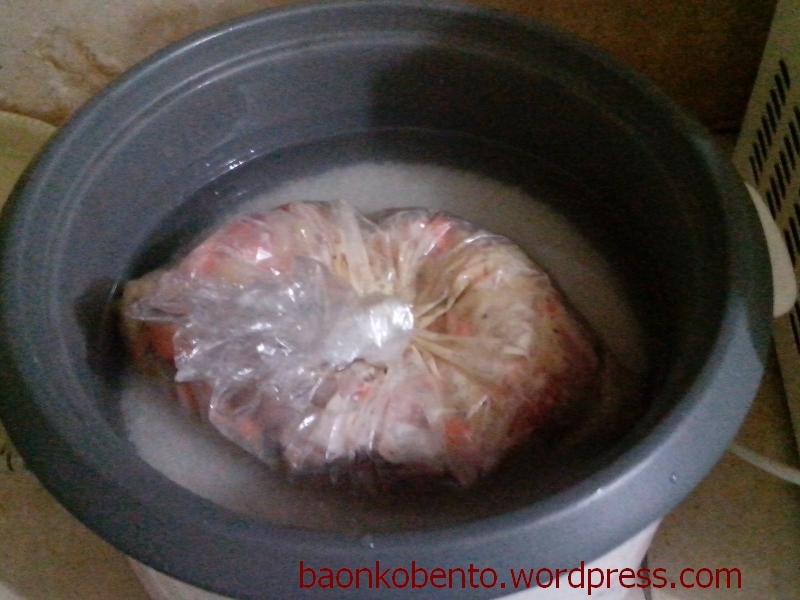 Place the bag inside the rice cooker, making sure that most of the bag is submerged in the water. I usually cook two cups of rice here, so there will be enough water to accommodate the magic meal bag. Turn on the rice cooker. Usually the rice will finish cooking faster than the 45 minutes required for the magic meal. What I do is to just set the rice cooker to warm (so as not to burn the rice) to keep the cooking of the magic meal going. I turn off the rice cooker at exactly 45 minutes. 5. The chicken pastel is ready to serve! 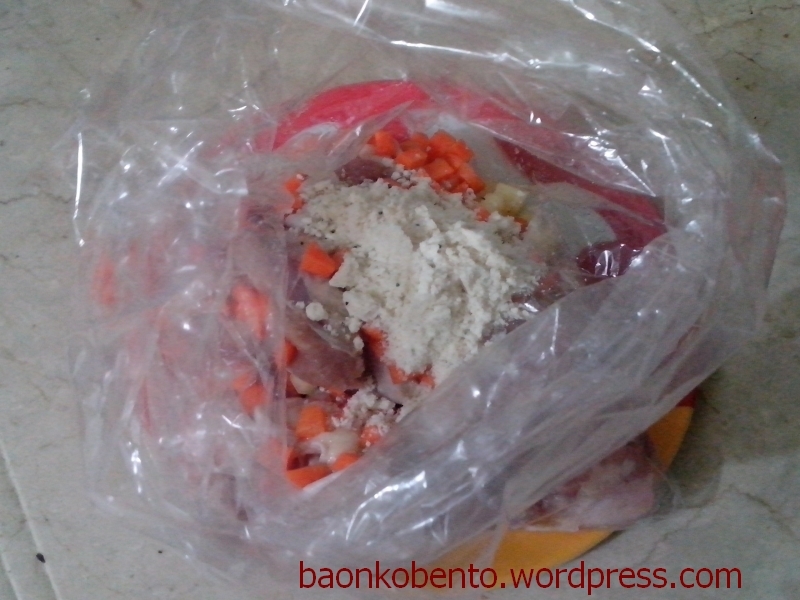 Cut open the bag and slide out the cooked pastel. Be careful here because the bag is probably very hot. This batch will probably give me about two to three sets of baon. I just spoon it over the rice and seal my bento, and it reheats pretty nicely in the microwave. 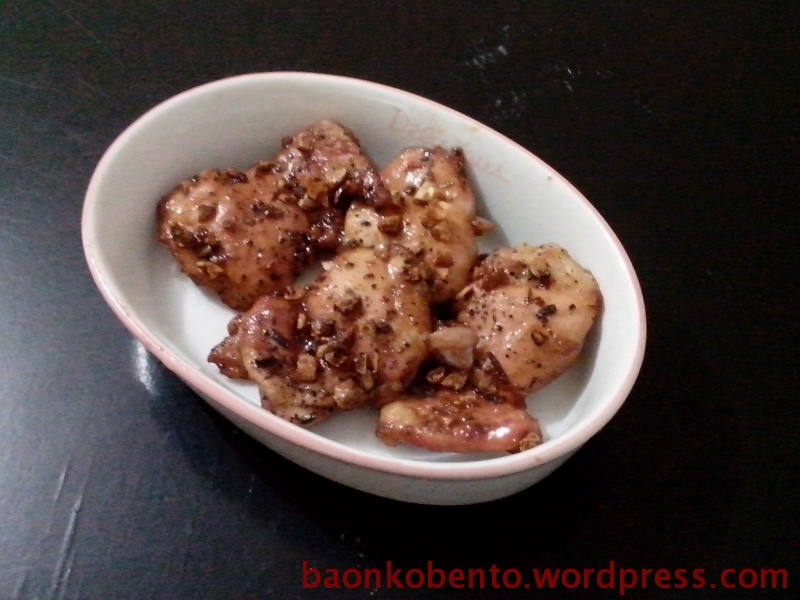 I will probably keep on using this kind of chicken, because it really made the pastel creamy and decadent. 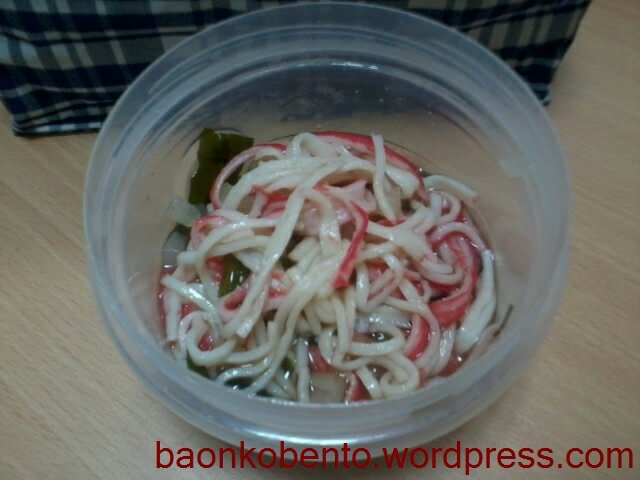 Maggi has three other kinds of Magic Meals: Lechon Paksiw, Bicol Express, and Afritada. 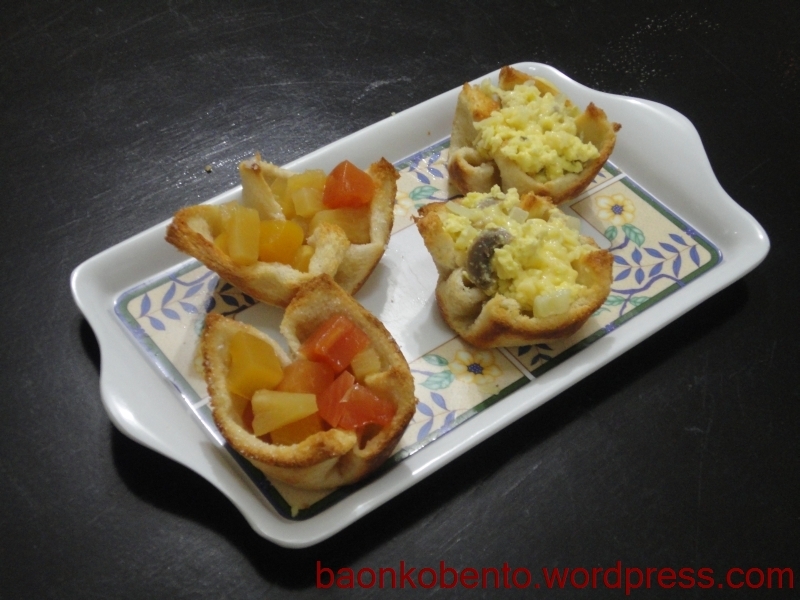 I’ve tried the first two, and Chicken Pastel remains my favorite. 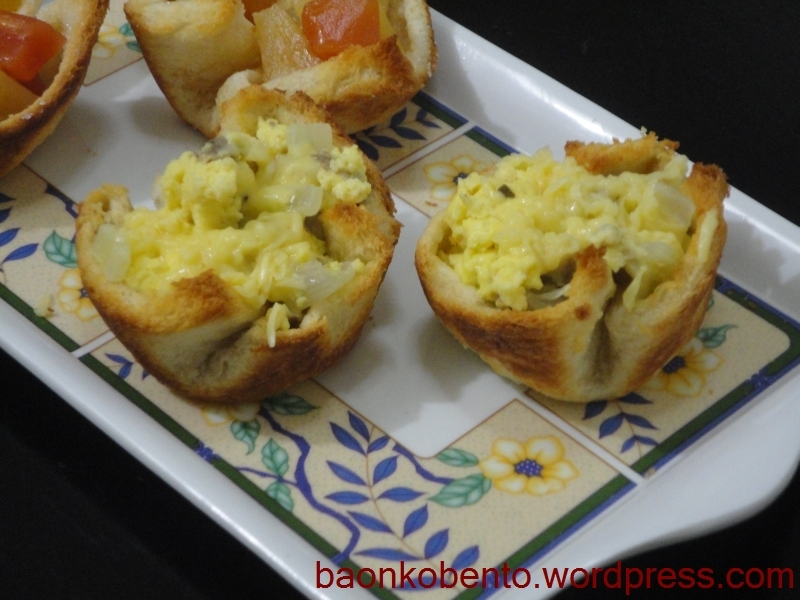 Have you tried Magic Meals? Which one did you like best? So I got some time to cook last week, and I’ve been hankering to try some baked/roast chicken recipes. Unfortunately I only had skinless chicken thigh fillets at the moment, so I decided on these two. It came out surprisingly juicy, and one can clearly taste the sugar in it. Unfortunately, there may have been too much sugar. Chicken should probably not be that sweet. 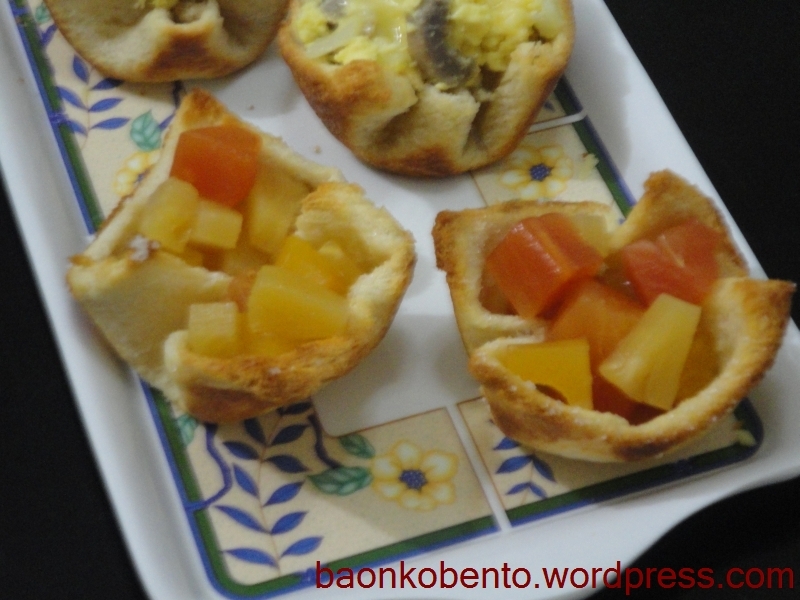 I will try variations of this recipe until I get the right mix. 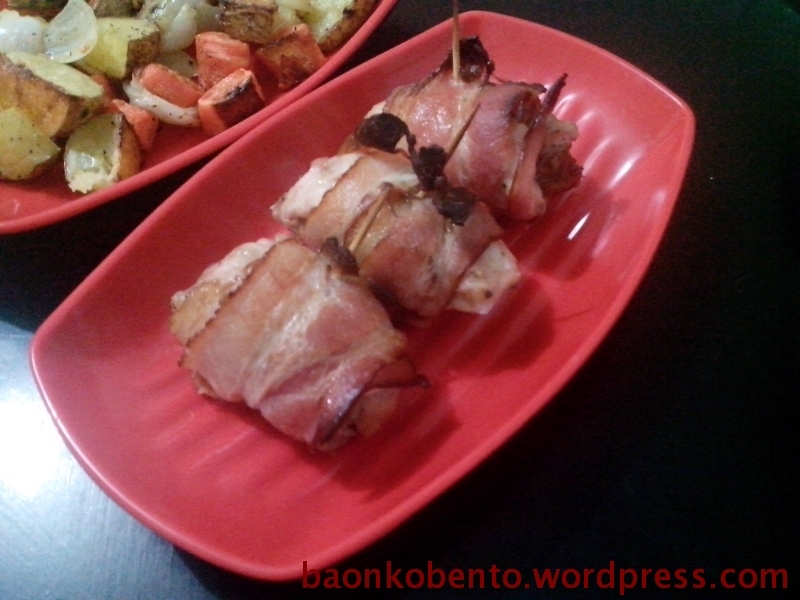 As there were only three rolls, and the other baking dish I had was much too big, I decided to roast some vegetables along with the bacon-chicken rolls. I chopped up some potatoes, carrots, and an onion, sprinkled a generous amount of olive oil on them, and topped with salt, pepper, and a bit of dried rosemary. 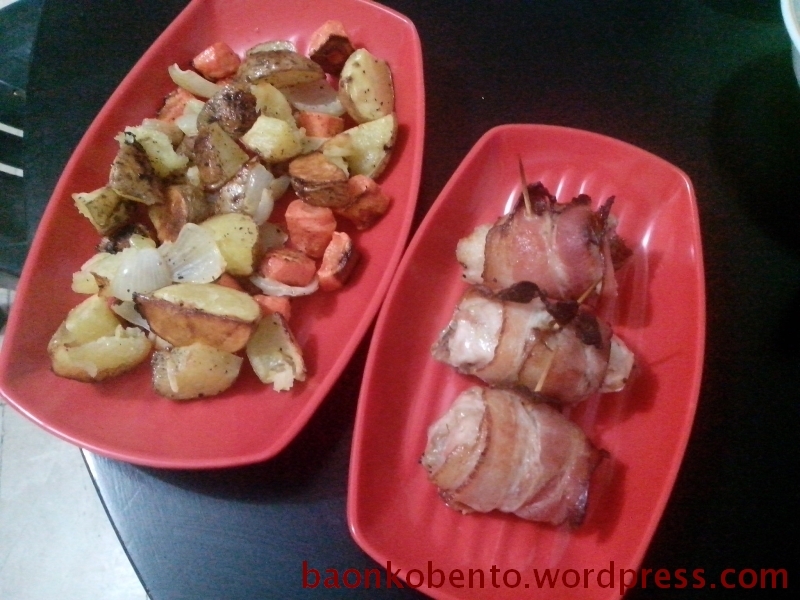 Here’s a picture of the roast veggies along with the bacon-chicken rolls. All I can say is, damn it was good! The chicken was juicy and the bacon went really well with it. Perhaps the two things I would change for the next time is a bit less herbs (since after all, I was using dried!) and maybe a longer baking time (I baked it for only 45 minutes). It’s my first time making curry, and I decided it shall be a vegetable curry. 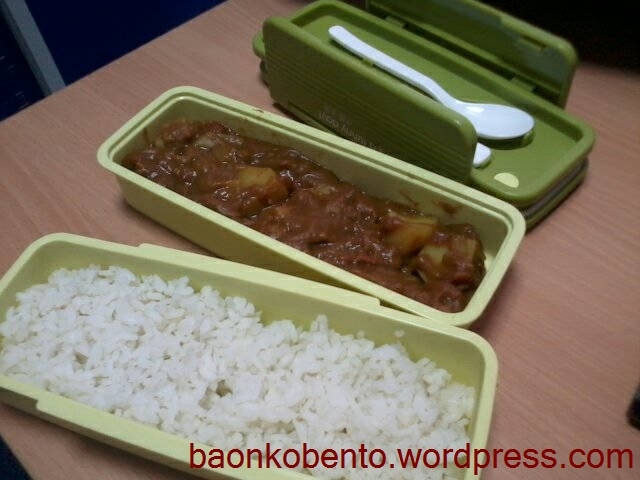 I made it using Golden curry mix (Japanese brand), since in my opinion Japanese curry is the best one to try for a first timer. I had a bit of vegetables that are nearing the end of their edible lifespan: a big carrot, three small potatoes, and a very large onion. I chopped them into bite size pieces. The instructions on the packet of curry mix said to saute the vegetables for a bit, then add enough water to cover. I did so, sauteing first the onion, then added the potatoes and carrot. I put in a tallish glass of water, then left it to stew. It seemed like there weren’t enough of the vegetables, so I added a large can of whole tomatoes. 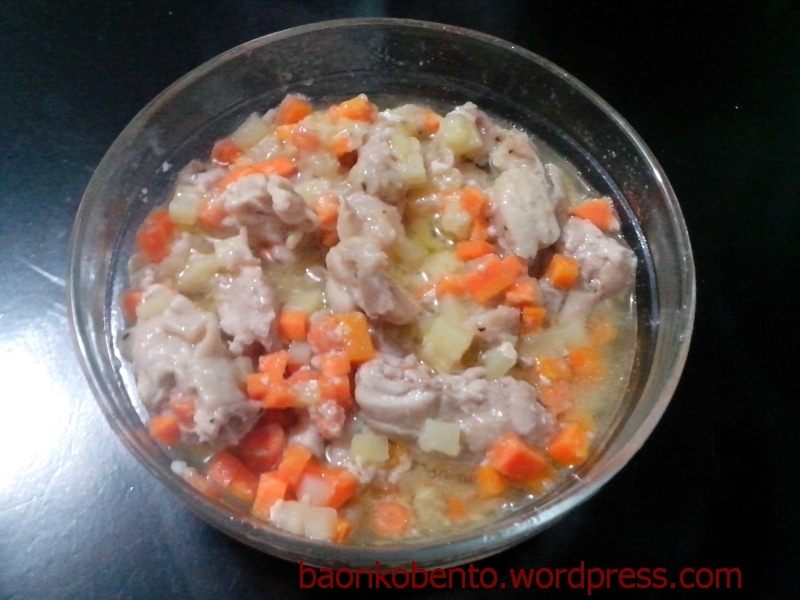 It took about 15-20 minutes of stewing before the carrots were soft enough. At this point, the next instruction was to drop in the curry roux. There were two packets of roux in the box of curry mix I bought. I put in the contents of one of the packets, and almost immediately I thought that there were too much roux. I let the roux dissolve a bit into the water, and it did turn out to be too thick. Another glass of water went into the pot, and it gave me my desired curry consistency. I didn’t add any herbs or even salt and pepper, since the box said that the roux already has all required herbs and spices. 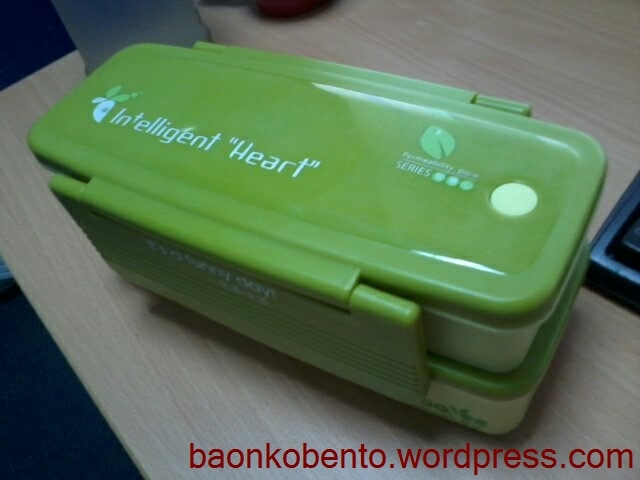 Pardon me, I just wanted to share a picture of my favorite bento box. First, a little back story. My parents recently received a bunch of seafood from an old family friend who is based in Palawan. One of the things they received was a huge whole fish, which my dad thinks is probably deepsea fish because it had little or no scales. It was about 1.5-2 feet in length, and about 3 kg in weight. Now my mom is currently out on vacation, and would not be able to cook this fish for my dad. Naturally she assigned me the task of making this fish edible. 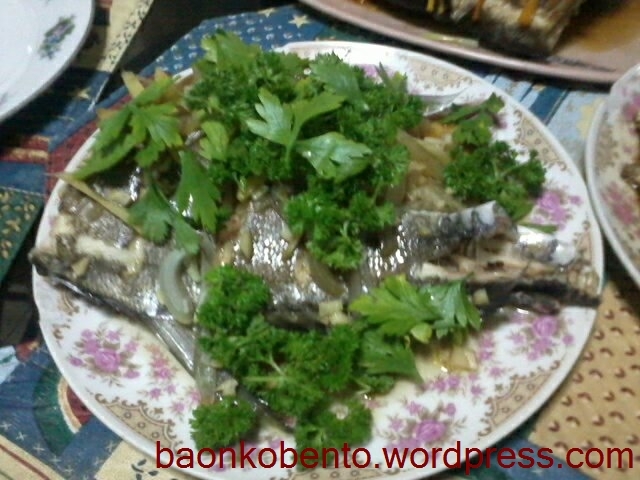 Since it would be mostly my dad who will be eating this fish, frying it would be out of question since he cannot eat very oily food. Baking would have been an option, except that their house does not have a working oven. The only methods left are steaming or stewing, and for whole fish it is probably better to go the way of the steam. I have never cooked fish prior to this since I’ve never learned the proper way to buy fish. It’s off to the internet for resources. 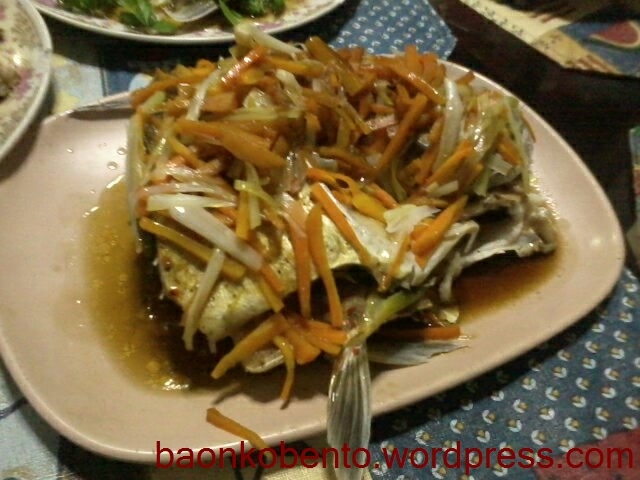 I found two recipes from Casa Veneracion that seemed interesting: Steamed Fish with Oyster Sauce and Spicy Steamed Fish (which incidentally also had oyster sauce). Since I had a huge fish, I figured I could do both if I cut the fish in half. That’s what I proceeded to do. 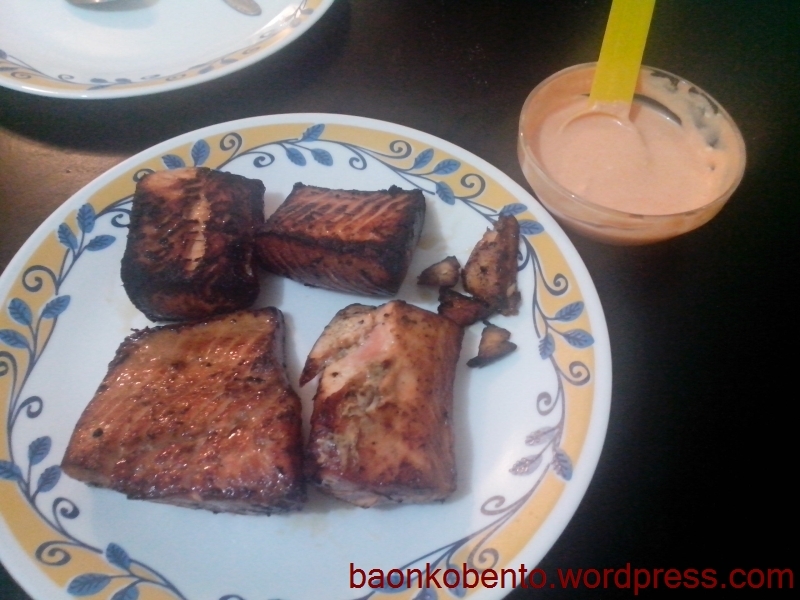 With the help from my dad, who gutted the fish (it’s his first time gutting a fish too!) and sawed it in half, and my brother, who sliced up some of the vegetables, I proceeded to cook two versions of steamed fish using my mom’s shiny new steamer. I had to adjust since the recipes instructed to steam using the oven. 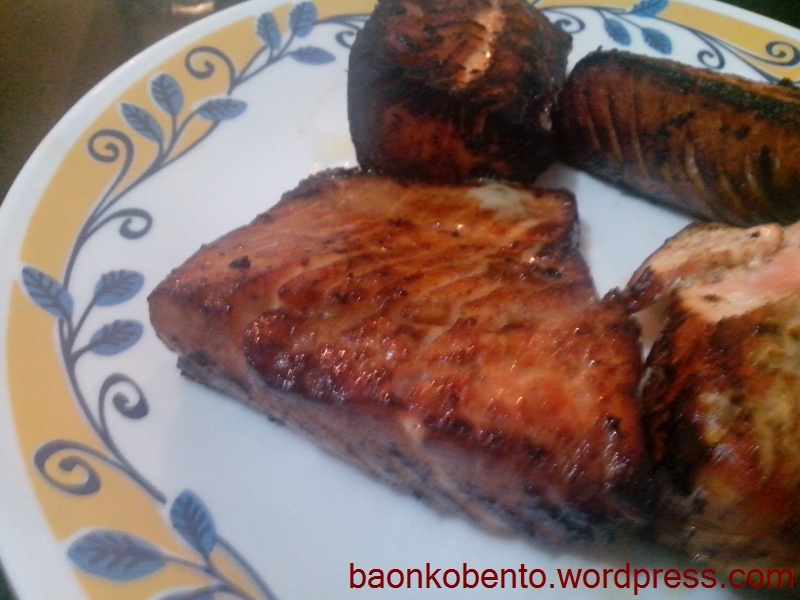 Essentially, I steamed the two halves of the fish at the same time since there are two levels to the steamer. I put the spicy one at the bottom and the non spicy one at the top so that the non spicy one will remain not spicy. I also lined the two levels with aluminum foil to prevent the juices from spilling. I started counting the minutes once I saw steam coming out of the exhaust hole in the lid, and I let the fish steam for about 20 minutes. Not bad, if I say so myself. The only thing I wanted to improve on was the spicy half, since it wasn’t really spicy enough to be noticed. 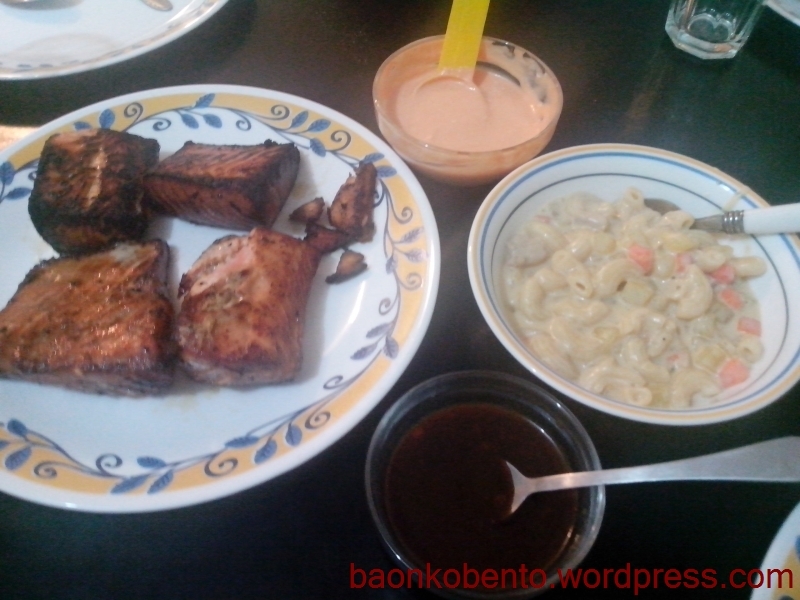 We ended up just slathering more chili garlic sauce on our fish as we ate it. 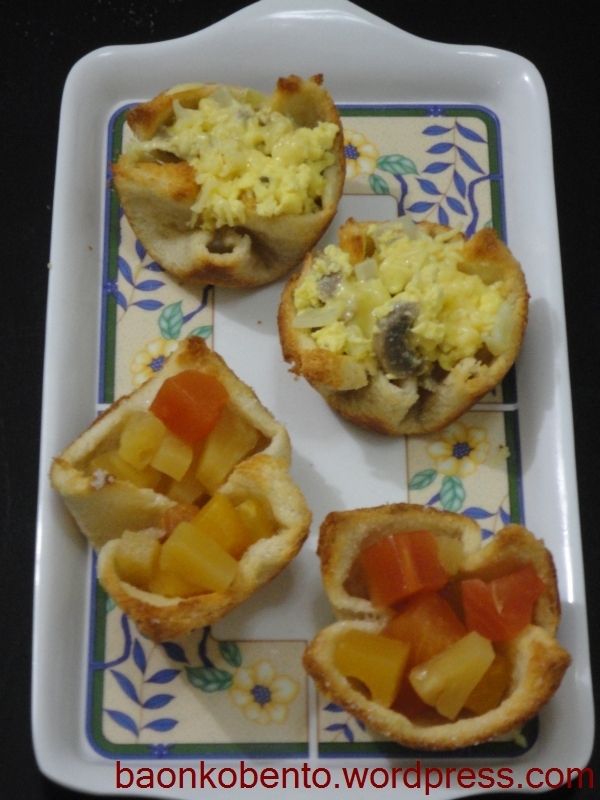 On the whole, I was just very relieved that it came out edible and not a disaster.